The Churchill Hotel is warming and inviting, quiet and sophisticated, a perfectly embellished with so many gems! We enjoyed a very impromptu week at the hotel without a single hiccup. The staff was superb and very friendly. Even through busy times and such the ladies at the front desk were always smiling and excited to help. It's really been a great stay because of service. Quite deserving of the Certificate of Excellence....and beyond. Ms. GIGI (MANAGER) please keep up the great work and keep smiling. If you're ever in Manhattan stop by Make My Cake! Ask for Ms. A. Tell her Jes sent ya! Being near Dupont Circle it was very convenient to lots of great restaurants, Metro and attractions. Our room was clean, comfortable and quiet. The staff were friendly and courteous. Having a car there was difficult as no street or local parking easily available, but they do have valet parking. The front desk agent named Robin should guide their customer experience with only being their 4 months and not knowing her educational background she has the most empirical knowledge base and that was her Soft Skill set. You can teach SOPs and the technical components but not the demeanor of enjoying your career and how it exudes from every interaction. The hotel was boutique, clean, and every interaction with all was hospitable. Breakfast I had was good food as well. Under a 10 minute walk to Dupont Circle Metro Station and the Same to many eclectic restaurants in either direction for 10 minutes away from the hotel. My wife and scheduled a short trip to the Capital City with only a week advanced notice. 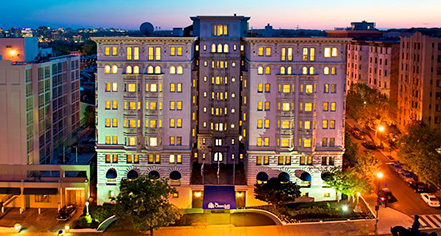 With the limited time we were a little apprehensive about lodgings, however any such worry was quickly set aside when we arrived at the Churchill Hotel on Connecticut Avenue NW. The facility was well maintained, had obviously been renovated/updated recently and was clean and bright. The staff was helpful and courteous each time we worked with them. It is less than 1000 yards to the Dupont Circle Metro Station so access to most of DC is easy. We would be happy to stay at the Churchill again. Everything was perfect! Perfect price and perfect hotel! Except for one thing: travel agent or the hotel Mistakenly duplicated my reservation even only charged my credit card once. I wouldn't find it out if I did not call hotel 2days before checking in to double check! If not, I would be doublely charged when I check out. Luckily, problem solved.